Multiple Representations – What is it and do you have any suggestions? The Principles and Standards for School Mathematics, National Council of Teachers of Mathematics (NCTM) have six principles for guiding teachers and schools in providing sound research-based mathematics education. Those principles are: equity, curriculum, teaching, learning, assessment, and technology. The ten Standards, however, are specific to what mathematics instruction should enable a student to know and do: content – Number and Operations, Geometry, Measurement, and Data Analysis and Probability and process – problem solving, reasoning and proof, communication, and representations. Recent conversations with teachers have to do with the teaching process standard of representations and more specifically, providing opportunities for students to show what they know in multiple ways and what would be the benefit to their mathematical understanding? What does it mean to represent what you know in multiple ways? Recognize equivalent representations of the same concept. It is through these representations that students can link various models of numbers, solve problems in multiple ways, and bridge from the concrete to the abstract. What are some strategies for incorporating multiple representations instructionally? The following is the description of group work that provides the opportunity for students to show what they know about solving various equations (linear with variables on each side, linear systems, and other function forms) and how each of these solutions are linked and equilvalent. In order to be able to share the results and process used with another group, each person is to take notes and record results. Then one representative from each of these groups (jigsaw method) forms yet another group for synthesizing the results. explain what the solution of the (linear system) means and reflect on the process. 3) The groups then provide multiple representations of the solution(s) of the problem posed using NAGS: Number (Tabular Values), Algebraic Solution, Graphing Solution, Sentence – explanation of what the solution provides. 4) Results are to be posted and explained to the entire group. Various graphic organizers can be designed as a note-taking device so that students can track their understanding. This model links the use of a concrete model (algebra tiles) for solving linear equations to verbalizing what the steps are using words, and then to the abstraction of the algebraic symbols. These experiences allow the student to mentally synchronize the visual, verbal, and written forms for solving linear equations; and to kinesthetically engage in with the mathematics. As students begin to develop number sense and connect equivalent forms of ways that number can be represented, multiple models of that number can be introduced. By doing so, some operations with Rational Numbers can be connected and justified rather than purely approaching the operation from an algorithmic stance. The connected and equivalent Rational Number forms are fractions, decimal fractions, percents, placement on the number line, circle model, and a set model. Using a graphic organizer where one of the representations is completed and students have to complete the other models provides opportunities for students to gain flexibility of toggling amongst the various Rational Number forms. 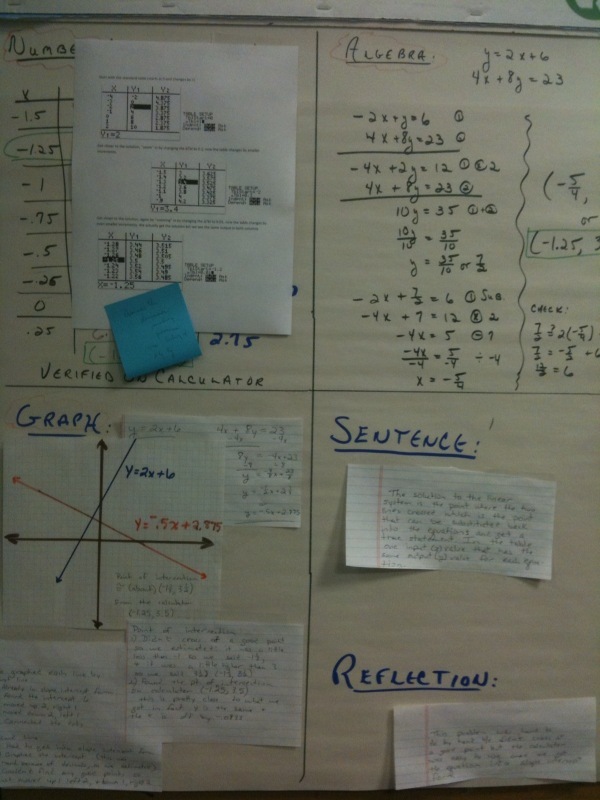 This entry was posted in Blog and tagged Instruction, mathematics, measurement, research. Bookmark the permalink.